Meet the successor ETHM-1 ! The ETHM-1 module offers the possibility of utilising TCP/IP communication in INTEGRA and VERSA control panels. 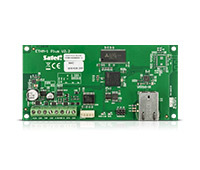 It facilitates TCP/IP monitoring and remote programming of control panels via the INTERNET. Additionally, the ETHM-1 module, in combination with INTEGRA control panels, offers the functionality of remote system control via the INTERNET by means of a computer, tablet or smartphone.